Editor’s Note: The following rumination on Vail History is also the introduction to The Understories, written by Steve “Louie’ Boyd and friends. 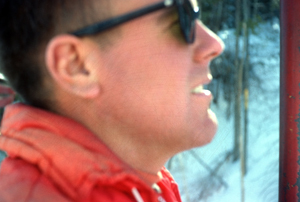 Steve “Louie” Boyd riding the original Chair 5 at Vail sometime in the early 1960s. Well, we were there, and fortunately we CAN remember a few things. Going through that process, and painting a picture of what life was like back then, has truly been one of the most enjoyable experiences of my life. The second edition here, I have told people, will be much more detailed, and much juicer, than the first edition, which was hastily put together in preparation for the Patrol reunion Sept. 21, 2012, which, by the way, was like an après ski at Donovan’s Copper Bar times ten. At the time, we were soliciting more stories from veterans of Vail’s early Patrol (or should I say “survivors”?). Thankfully, many different patrolmen have contributed their stories, photographs and memories to this edition, and it’s also true that every Patrolman contributed in his own way simply by being there in those days. I also want everyone to know that, even though my byline is on the greater portion of these stories, in fact many of them come from tales that my old Patrol buddies have told me, and shared with me, and I’ve taken notes on over the years during our Wednesday ski days. In this second edition, myself and the contributors have humbly tried to paint a picture of a very unique time and place. Remember that the cultural revolution was taking place, even though we weren’t aware of that, as we were in our isolated, sequestered environment. We had no TV, no radio except up at PHQ, and no newspapers really (except for the Vail Trail, of course). We were also in a very unique place, with very unique characters involved. We describe the characters and circumstances with a great amount of color and innuendo, leaving a lot of it up to personal interpretation. My hope is that no offense is taken. This also isn’t a historical account of perfectly recorded dates and times. It’s mostly about the episodes, the characters, the spiritual love of the mountains, and the pioneer spirit of creating your own way, your own successes. I would also like to point out that, in spite of our well-deserved reputation as nothing but naughty-boy party animals, almost all of us, after our patrol days, somehow achieved successes that fit within a broad spectrum. Of course, there are many different interpretations of what success means, and I don’t mean the Forbes Magazine, Wall Street, or Hollywood versions. If happiness, contentment, “living the dream,” skiing together on Wednesdays still to this day (that is, the ones with knees and livers left), time spent skiing, hunting, and fishing with the grandkids, are part of being successful, then we have truly arrived. All of us had made our own degree of contribution to the success of Vail, because if Vail had not succeeded we wouldn’t be here. In a New York heartbeat. Throughout all that time, and still to this day, a personal mantra of mine has been, “Why grow up when all you do is get old?” During this time I’ve also had two long-standing fantasies (besides the girls that is) one of which was building a cabin in the woods, and the other was to do some writing. I have built my cabin/retirement home in Marble, and now, with the creation of this publication, I have humbly accomplished both (you all be the judge). Not quite a year before Pete Seibert’s untimely demise I was fortunate enough to have a really nice, one-on-one conversation with him at the Shaw Cancer Center, where I myself was going through a serious bout with melanoma. I explained that we early Vail ski patrolmen truly had the desire to become, and were encouraged to become, the best ski patrol in the nation (if not the whole damn world). We also had the inclination, as a sort of informal competition after clocking out, to be the absolute worst we could possibly be (all in good fun, of course). Pete smiled that knowing smile, but I surmised it was not necessarily a smile of forgiveness. Some months after I saw Pete on that day at the Shaw Center, I believe it was at Charlie Gerbach’s wake, I mentioned this same encounter to another old patrolman named “Weed,” one of Vail’s more notorious bad-boy patrolmen. So that’s what these Understories are all about. Some would say we were nothing but a bunch of hedonistic, irresponsible, irreverent, undisciplined, naughty, very bad boys who were absolutely hell bent on exhibiting all sorts of outrageous, egregious behavior – and they would be mostly right. As a challenge to the later patrols from the ‘70s, ‘80s, and ‘90s, with our avant garde attitudes, that they would write down their own stories so that we from the ‘60s are assured, without any doubt, that the spirit lives on. ‘The Understories: A Patrolman’s tales of life in the early days of Vail and Aspen’ is a full-color, 162-page book featuring more that 60 vintage photographs of Vail and Aspen from the 1960s and 70s. Written by Steve “Louie” Boyd and a host of other Vail pioneers, the book is available for sale for $29.95 at The Bookworm in Edwards, The Colorado Ski and Snowboard Museum Hall of Fame, and online at www.theunderstories.com/purchase. This entry was posted in Blog and tagged books, chair 5 vail, christmas gifts, history, powder skiing, skiing, snowboarding, steve boyd, vail back bowls on December 3, 2013 by tomboyd.